Garden Autumn Festa September 1 - October 15 held! From 1st September 2017 until 15th October, the Garden Autumn Festa of the Hokkaido Garden Highway was held. The Autumn Hokkaido Garden Highway is full of ingenuity to enjoy the fruitful autumn! Please challenge everyone for "8 Garden Treasure Hunt" where you receive a luxury prize. 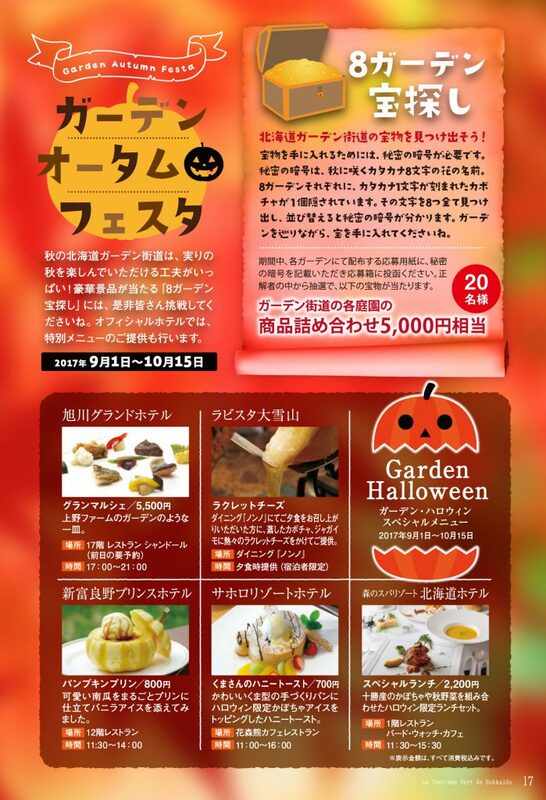 At the official hotel, we also offer a special menu as a garden · Halloween special menu. ● Find the treasure of the Hokkaido Garden Highway! To get the treasure, a secret crypto is necessary. The secret cryptosynonym is the name of the flower of eight letters of katakana that blooms in autumn. 8 Each garden has a pumpkin with one letter carved in katakana hidden. Find all eight of those letters and sort them to see the secret cipher. Go around the garden and get the treasure. Please list the secret code on the entry form distributed at each garden during the period and post it in the application box. From the correct answer, the following treasure will be hit by lottery.